The Eight Immortals are 8 gods in Chinese mythology. Each of the Eight Immortals has huge power to be transferred to a power tool that can bestow life or destroy evil. From legends of China, the tale of Eight Immortals crossing the sea is one of the well-known myths. In order to cross the great waters, each of the 8 immortals use his/her owe power to achieve the goal. Eight Immortals are He Xian'gu, Han Xiang Zi, Lan Caihe, Li Tieguai, Lü Dongbin, Zhongli Quan, Cao Guojiu and Zhang Guo Lao. They are believed to have huge powers to help people solve problems. Displaying such statue at home/office can ward off the bad chi, problems and troubles. 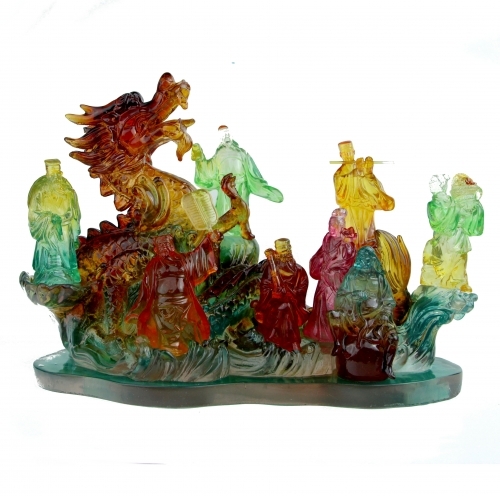 The dimension of the statue of Eight Immortals Crossing the Great Waters is approx. 13.5" x 6.75" x 9.25". It is made of resin and very heavy (approx. 8 lbs).